Want to know where to eat in Chicago? Head to where several James Beard Award-winning chefs have all set up shop — the West Loop. The thriving West Loop community bustles with trendy restaurants and a vibrant art scene. The site of Chicago&apos;s wholesale markets and warehouse districts, the West Loop and neighboring Fulton Market District is known for celebrity chefs and innovative cuisine along "Restaurant Row": the one-mile stretch of Randolph Street between Halsted and Ogden. This one neighborhood alone will fill your Instagram feed. Follow this food-filled itinerary for a peek at what’s on their menus. corn all over our menus! sweet corn potato pierogies with baby bok choy crème & smoked tomato rhubarb chimi at #girlandthegoat! Stephanie Izard took home the title of first female to win Top Chef in 2008, and was also honored as James Beard’s Best Chef: Midwest in 2013. She is the chef/partner at three renowned Chicago restaurants: Girl & the Goat, where Izard serves innovative small plates with global influences; Little Goat Diner, a tribute to timeless diner eats; and Duck Duck Goat, featuring a menu of "reasonably authentic" Chinese food. Grill-crisped tlayudas for dinner service @lenabravachicago. Plus 160 expressions of Mezcal. Hungry? Thirsty? Rick Bayless rose to celebrity status after winning Bravo’s Top Chef Masters and hosting the long-running PBS series Mexico—One Plate at a Time. Lauded for changing the perception of Mexican food in America, Bayless’ six critic-approved Chicago restaurants include the James Beard Foundation Award-winning Frontera Grill, which serves up creative Mexican fare in the River North neighborhood; and Michelin-starred Topolobampo, a 2017 James Beard Award winner for Outstanding Restaurant, where south-of-the-border favorites receive an upscale twist. In the West Loop, don&apos;t miss Lena Brava for Baja-style seafood or the neighboring Cruz Blanca Brewery & Taquería. Sarah Grueneberg has been experiencing a meteoric rise sine opening her first restaurant, Monteverde, in 2015, but also was in the spotlight as Top Chef: Texas, Season 9 of the Bravo series in 2011. Originally from Houston, Grueneberg moved to Chicago in 2005 to join the team at the award-winning Spiaggia under the leadership of Tony Mantuano. Beginning as a line cook, she quickly rose the ranks to Chef di Cucina in 2008 and then Executive Chef in 2010. During her tenure as Executive Chef, Spiaggia was awarded one Michelin Star for three consecutive years. 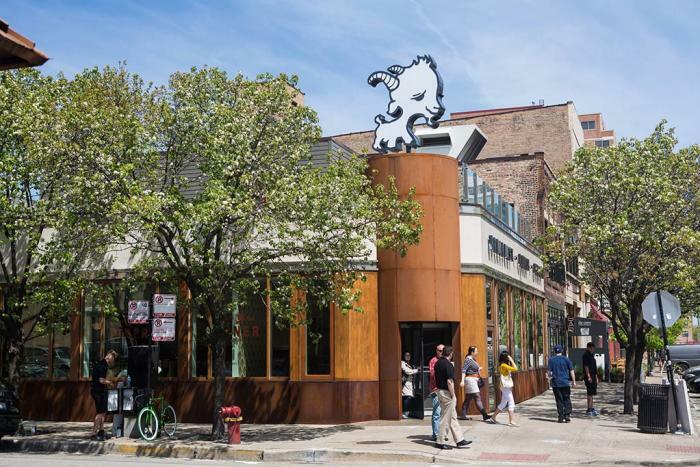 South Halsted Street is the heart of Greektown — creating a secondary food gateway! — and is teeming with Hellenic bakeries, tavernas and restaurants that specialize in flaming saganaki and gyros. The indoor Chicago French Market features dozens of authentic food vendors offering a potpourri of eats such as sushi, beer and sweets. PRIMITIVE, Inc. carries a collection of one-of-a-kind jewelry, furniture and artwork. At Doughlas Dawson, find African, Asian and American historic art. Tour the National Hellenic Museum and explore ancient Greek art. Head to City Winery for a wine dinner and intimate concert. Peek into Old St. Patrick&apos;s Church, it&apos;s one of the few buildings that survived the Great Chicago Fire. Take the Morgan &apos;L&apos; train stop on the Pink and Green Lines.